Even though we’ve been dedicated to tubeless tyres since the beginning, we’ve always struggled to offer much in the way of choice when it comes to tubeless compatible road tyres. 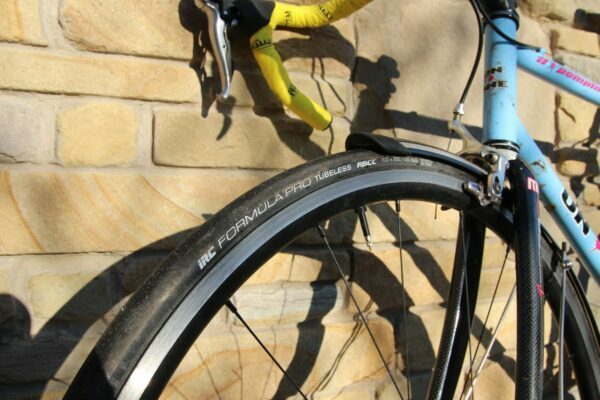 10 years ago the Hutchinson Fusion was the only option, and it was a pretty good tyre for the time, maybe a bit narrow and slipped easily on steep climbs but it rolled nicely and was very puncture resistant compared to an inner tube. Then the Schwalbe Pro came along; wider, faster rolling than the Fusion, and lighter too. The “Pro” was followed a couple of years later by the “Pro One” which was more of the same, only better (lighter, wider, faster), so it’s what we’ve been recommending with our wheels ever since. It’s not for a lack of trying that we haven’t been able to offer any other options, we have looked around but there just aren’t many excellent road tubeless tyres available from the usual brands. Continental have only just brought out their first, the GP5000-TL, but we haven’t had a chance to try it yet. We tried the Maxxis Padrone TR once the price was reduced from the original comical £200 each, but apart from being impossibly hard to inflate they were energy-sapping, narrow, and turned me into a nervous wreck going around corners. So until now it’s been the Pro One we offered with our wheels, but they are not perfect. Grip in the dry is excellent, but grip in the wet is merely reasonable as I have found out to my cost a couple of times and picked up the scars to prove it. They come up large which is good for cushioning and resistance against impact punctures, but they do balloon out a little bit even on wide road rims giving uncertain handling under hard cornering and a less than ideal shape for aerodynamics and stability in side winds. They also have a tendency to wear to a squared-off profile after a couple of thousand miles (or less if you skid a lot). Ingenious, but you can probably see why I was sceptical. Luckily, Malcolm from Velo Distribution, the UK distributor, could see I wasn’t convinced and gave me a pair to try out…. The tyres look and feel really nice even before you unwrap them. The rubber is tactile and supple, and it forms a tread across the entire surface from bead to bead unlike, for example, the Pro One which just has tread on the top of the tyre. IRC claim this is for puncture resistance and I could see it working, because I have had small slices to the sidewall threads of other tyres which don’t seal easily. Tread is a light chevron file pattern in rows which alternate in direction across the rubber. Two conflicting requirements here, the tyre needs to be loose enough to fit on the rim, but tight enough that it inflates easily; a loose, baggy tubeless tyre is hard to get seated, and can lead to tantrums after 30 minutes of failing to inflate. I first tried fitting these to our Lark20 Light wheels which are my everyday runaround set, and the IRCs fitted easily enough with a strong thumb press to get the last bit of bead fitted, no tyre levers needed but they were slightly tighter than the Schwalbe Pro Ones. Inflating was easy and immediate, no fiddling, just pump straight up. After a few months of testing these tyres I fitted them to another wheel and the bead seemed to have stretched very slighty making it easy to fit to the rim, but harder to inflate. 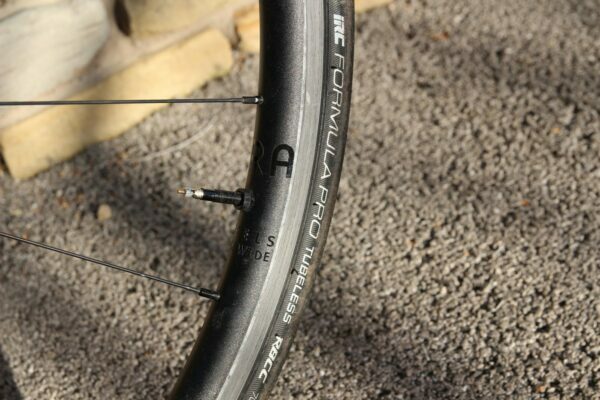 The IRCs measured very close to their nominal size, 25.5mm in fact on the Lark20 wheels. This is much smaller than the Schwalbes, with the Pro Ones 25c measuring a whopping 28.6mm on the same rim. In terms of tyre height (measured from rim edge to top of tyre), the IRCs at 22.2mm were again dwarfed by the Pro Ones at 25.5mm. The IRCs measure almost exactly the same outer width as the rim on these wheels so there is a nice, very smooth transition from tyre to rim – important for aero efficiency and handling in side winds. With the tyre being so much smaller than the Pro One, I pumped it up to a good 90psi (more than my usual 75-80) and prepared to get my teeth rattled. Except that didn’t happen. The first and most obvious thing I noticed about these tyres was an unexpectedly smooth ride, they take the edges off any sharp bumps in the road. For such a comfortable tyre it seems very fast too – it’s hard to say without a side by side comparison (something for a future blog post) but it seems to roll as fast as any tyre I’ve tried. Going in a straight line is all very well but sooner or later you have to make a turn, and cornering on these tyres is a lot of fun. The smooth rounded profile means there’s no sudden transition midway through a turn and maybe it’s the rice bran doing the work, but I have never felt I was going to run out of grip on these tyres. Even on rough surfaces these tyres stay stuck down nicely. In rain there is certainly more grip than with other tyres. Locking up the rear wheel doesn’t lead to an uncontrollable slide – you can feel (and hear) the fine tread trying to grip and it comes back under control much faster than, say, the Pro One. These are great tyres and I highly recommend them. They feel fast and improved the ride of my bike both from the smooth ride and more cornering grip in the rain, and they haven’t shown any signs of wear in the 3 months or so I have been using them. We will continue to offer other road tubeless tyres with our wheels, but these IRC Formula RBCC are now top of our list of recommended tyres. I hear that Mavic do a tubless tyre and wheel combination and they are one of the easiest to put together. They say that they engineer the wheel and tyre within one millimetre. No baggy tyre and easy to inflate. Mavic are really on this. The problem with using the Mavic system is that you’d be stuck with their heavy, narrow wheels and totally proprietary parts though – Mavic may be really “on this” with the tyre fitment – and I haven’t tried any so I don’t know if their claims stack up – but they are 5 years behind everyone else on the wheels. 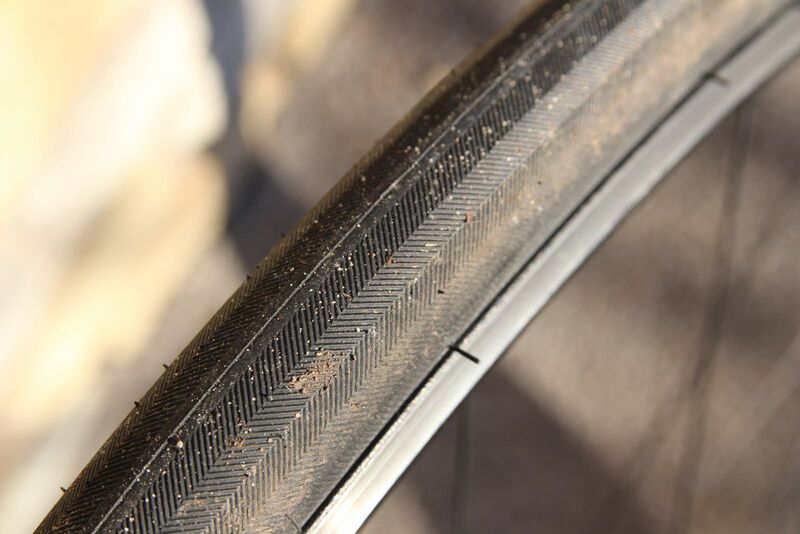 It’s definitely a (minor in my opinion) negative point that the IRC bead stretches slightly, which is why I mentioned it in the review, but they are really excellent tyres apart from that. The Schwalbe bead consistency is normally very consistent (though we have had a report of a looser Pro One) and would be a good choice where easy inflation is a requirement. But since the inflation problem is solved by using an airshot or compressor, I think ride quality is the most important which is why I would recommend the IRC RBCC first, Schwalbe second. I highly recommend the Hutchinson Sector 28s. I’ve had a couple of pairs and they’ve been seriously abused hitting kerbs at speed [by mistake], being used for lots of technical and rocky off road riding and high speed brutal gravel trails. I use them at 40-45psi on your Jawbones/Pacenti SL25s. Quite remarkable tyres.